This product was added to our catalog on Saturday 31 December, 2016. 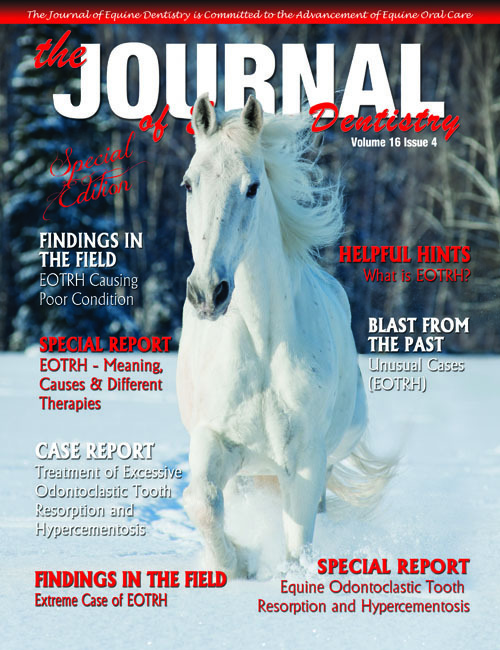 Equine Odontoclastic Tooth Resorption and Hypercementosis (EOTRH) is a painful condition most often found in older horses. This disease mostly affects incisors and canine teeth, but can affect molars as well. The body starts to resorb the affected teeth in this disease. 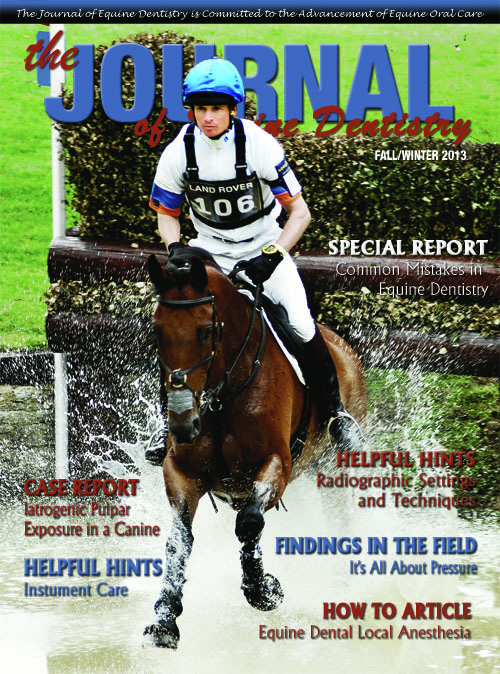 This article will highlight a few EOTRH cases. 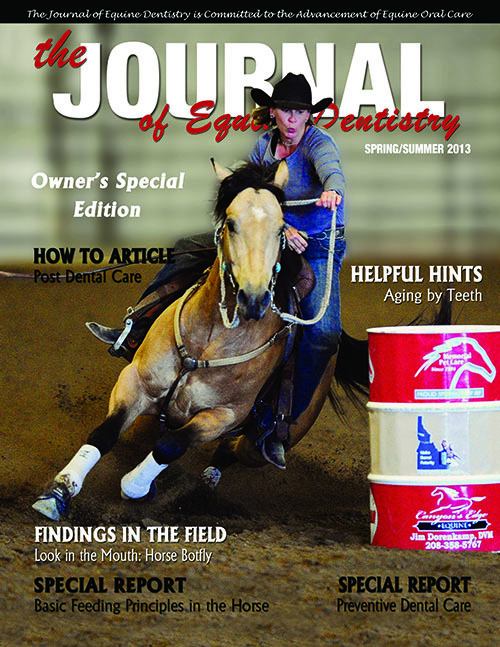 A 25-year-old Quarter horse gelding in poor condition, with no history of previous dentistry, was referred for dental evaluation. 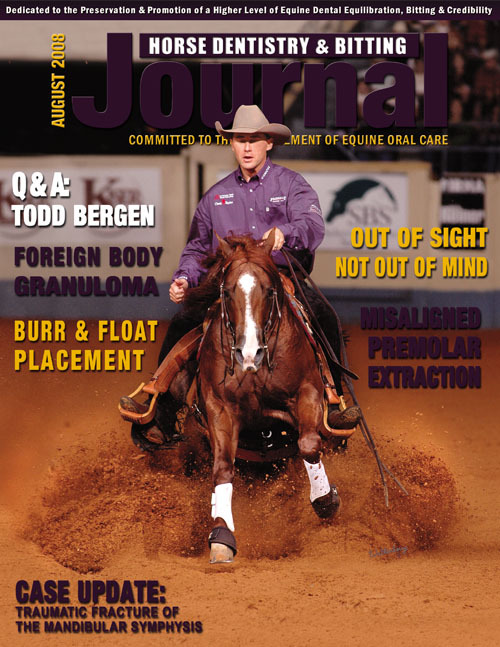 There was odor coming from the mouth and this horse was sensitive when handled during oral examination. There was an incisor missing on both the upper and lower arcades and the lower canines were slightly mobile. The etiology of EOTRH is poorly understood at this time. While resorptive diseases are well studied in humans and small animals, hypercementosis as seen in the equine form is not generally present in these other species. 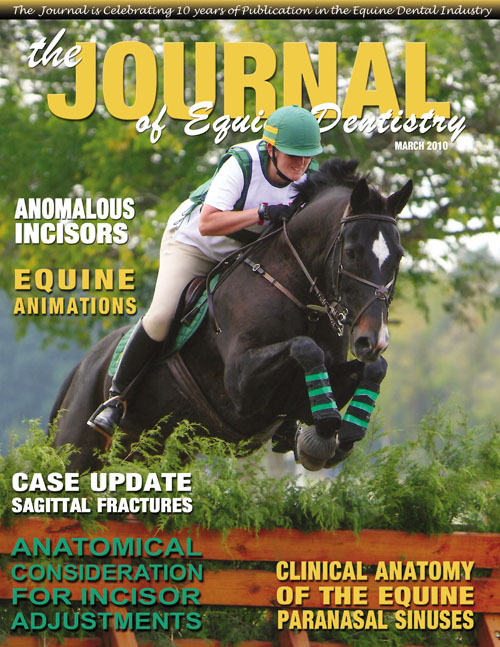 As with most equine dental conditions, comparisons with other species can provide some clues but is not that helpful in understanding the root cause of the condition. Anecdotally, it appears that horses in certain regions of the world are much more affected than others – at least based on personal conversations and experience by this author. For example, practitioners in Brazil report extremely rare instances of EOTRH while colleagues in Germany see large quantities of horses affected. Epidemiological studies would be helpful in ascertaining a more solid understanding of the possible causes behind this painful disease. The upper incisors were so long that the lips couldn’t close completely. The gingiva was a red and inflamed with drain tracts and the teeth were mobile. He had tartar and feed packing in his incisors causing a foul odor. The 102, 103, and 306 were missing. There was tartar on the canines and the 403 and 404 were mobile with draining tracts. There were hooks on 106 and 206, and feed was packing between 106 and 107 and 206 and 207 causing periodontitis. Both arcades had a slight wave and the upper 9’s were beginning to expire. There are a minimum of three different types, and because of the different symptoms we need to call it EOTRH-Syndrome as it is used for example in the colic diagnostic. Colic is not an illness. It describes symptoms which could be a result for different reasons. The classification by fistula, hypercementosis or resorption is not really useful, because every infected tooth has these clinical or x-ray signs, even every infected cheek tooth. The only solution in the eye of the author is subdivision. The major finding was massive EORTH of the incisors, causing discoloration, edema and fistulation of the attached gingiva over the affected tooth roots. She showed signs of pain during clinical examinations triggered by incisor mobility and periodontal inflammation. Radiographs revealed alveolar bone lysis and bulbous enlargement of the intra-alveolar parts of the teeth. The 303 and 403 were fractured. Based on the horse’s history, oral exam and radiographs, the decision was made to extract all infected incisor teeth due to the progressive inflammation and pain. After complication of a stroke he was euthanized. I was able to attain the skull after speaking with the owner about using it for educational purposes. 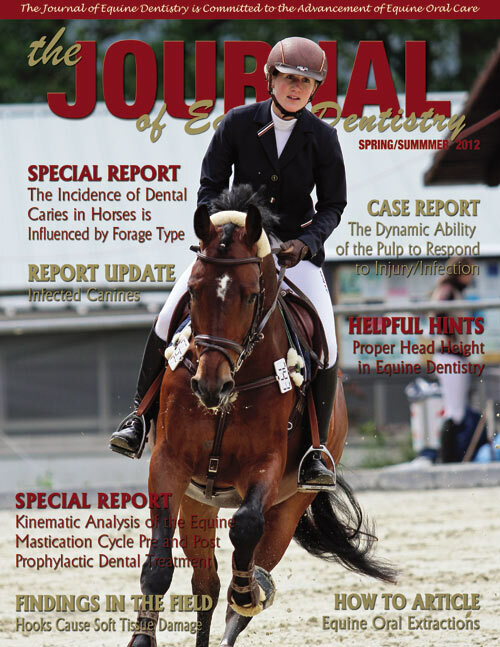 As equine dentist, it is rare to see such as extreme case in the field. At this time we still not know what causes EOTRH. Each case is treated differently depending on severity of the infection. A preventative cure in the future could possibly help cases such as this. Obviously, there is inflammation of the periodontal tissues and if chronic, that alone could explain the hyper reaction of the cementoblasts to produce excessive cementum. What is causing the inflammation and why does it persist? Two of these cases improved with antibiotic therapy so we assume that a bacterial infection is causing the inflammation. However, the infection seems to return sometime after treatment is discontinued. If the immune system is deficient, which may be due to numerous causes, then the infection can reoccur. Two of these cases involve older horses, which alone can diminish the immune response. Seventy percent of horses over the age of 20 have some degree of endocrine system deficiency, which affects the body’s ability to fight infection.